Wait, what? Another X-O Hardcover, exactly like LCSD? Looks like X-O will likely live on after #25. Glad to see that. wait, what the *SQUEE*?!?! $4.99 per issue? Sure, 40 pages, but seriously? This LIVEWIRE cover is terrible. This CAFU cover is wonderful. Not very dynamic but it feels so good to see these characters again. Any one of them deserves a solo series over War-Monger. Yeah, they did the same thing last year for SECRET WEAPONS. looks like a badass line up of books. come on guys... tell me there aren't some kick *SQUEE* covers for this month. I am very excited for the next chapter from Joshua Dysart. I'm pretty sure they always said there would be a non-LCSD printing. The difference is this one isn't signed and numbered. I'm good with paying an extra buck for LADOTH as long as it's prestige format. If not, which is what it looks like from today's solicits...there will be blood. They teased this as premium format and they better follow through, we have endured a lot of bad will lately do not deny us this gesture of good will especially if the price is a buck more. No premium format for LADOTH and I will rage!! Oh my god, chill out. No one is going to buy LaDoTH. It's obviously going to be a sleeper hit just like Harbinger and Imperium. We're all going to love it, but the rest of the comic fans in the world aren't going to give a *SQUEE*. Hey, maybe I'm wrong, and I would love to be, but history shows that the industry hasn't been fair to Dysart's contributions to the Valiant U. That said, DMG knows that every single one of us is going to buy it. Every "real" Valiant fan is going to pick this up. So seeing as they're putting a lot of money into this (marketing, Suayan, CAFU and other artists), this is probably just one small way to ensure that they make something back. If nothing else, Dysart deserves it, and so does DMG/Valiant for even publishing this in the first place. Also, it's 40 pages, so it's not like you're just getting a normal issue. I will not chill out until I hear this is premium format. If they can wrap a turd like XO in premium format then surely LADOTH is more than worthy. I honestly feel VEI owes us one and this is it, don't squander it. Will there be variants for issue #1? Including the Pre-order edition there are 5 covers plus one blank cover. They can all be seen by clicking on the hyperlink in the first post. I posted the cover to the Pre-order edition several posts up. Lite month for me. Anybody got a link to the article that announced Shadowman ending at #11. 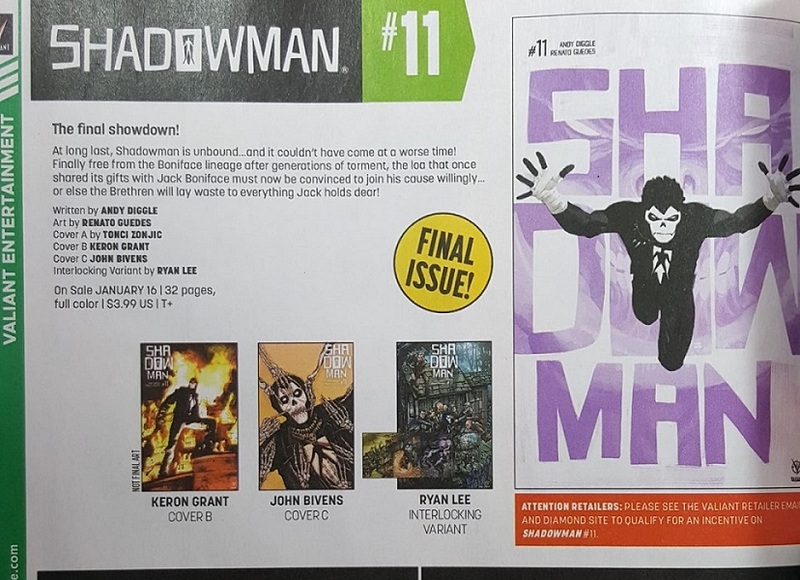 Anybody got a link to the article that announced Shadowman ending at #11. So much for the two years Diggle had planned out! I guess Bloodshot is taking the worst dump ever. Wow, too lazy to bother drawing faces for the HC characters there?